Yellowjackets, Vespula spp. 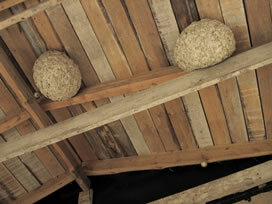 and Dolichovespula spp. 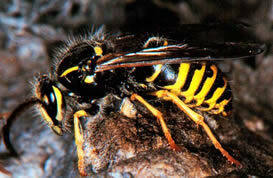 Vespula spp. and Dolichovespula spp. All states; various species. 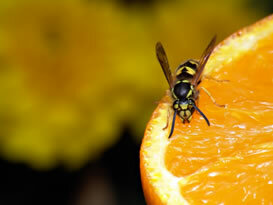 The most common yellowjacket pests are: common yellowjacket (Vespula vulgaris)--most of the U.S.; eastern yellowjacket (V. maculifrons)--east of the Rocky Mountains; German yellowjacket (V. germanica)--northeast, central, and west coast; western yellowjacket (V. pensylvanica)--west, northern mountain, Hawaii; southern yellowjacket (V. squamosa)--eastern (south of NY), north central, gulf, southeast; aerial yelowjacket (Dolichovespula arenaria)--Alaska to southern California, southwest, and central and northern part of east coast. This page has three tables, (1) Identification, (2) Look-alike Pests, and (3) Biology and Habits.